Book in Brief: This self-help guide was developed to provide basic information to lay-persons about vocal physiology, vocal health, and vocal “personality”, as well as a step-by-step program to optimize voice production. It can be used in conjunction with a structured voice therapy program, or for home study. Based on current understanding of vocal physiology, the physical program includes detailed descriptions and original cartoons demonstrating exercises to: improve posture; increase relaxation and flexibility of speech articulators; coordinate speech breathing and phonation; enhance resonance effects; use meaningful intonation; and improve phrasing patterns. In the appendix, the program is summarized in twelve removable wall posters that can be used in group therapy programs or for home practice. It is ideal for teachers, singers, sales representatives, public relations personnel, counselors, and other individuals who rely on their voices to conduct their daily work routines, or who need basic information for vocal performance. The book is available in both English and Spanish. The cost is $35.00 CAD each for order quantities less than 20 and $25.00 CAD each volume discount price for order quantities of 20 or more. Shipping is included. Linda Rammage’s new book, Vocalizing with Ease, brings to the voice user the best of two worlds: it explains the complexity of the workings of the human voice with a clarity and an ease that does much to lift the fog and help to de-mystify our understanding of the instrument; and it achieves this not inconsequential feat with a sense of humour rarely encountered in the literature of voice. Linda Rammage, together with her collaborator – illustrator Michiel Haijtink, has produced a self-help book for voice users that is as thorough and practical as it is delightful and amusing. The book which Ms. Rammage describes as “…a therapy guide for people who want to improve their voices”, is essentially divided into two parts; the first five sections discuss the voice under the headings: 1. What Voice Is, and How Your Speech Equipment Works; 2. Your Voice and Your Health; 3. Your Voice, Your Emotions and Your Personality; 4. Your Voice and Your Job; and, 5. Your Voice and Your Life. Part two, entitled “The Physical Program” leads the reader through a series of practical exercises that deal (sic.) with Posture, Voice Onset, Resonance and Articulation, Tuning, Extending the Dynamic Range, and Phrasing. The sense of humour of the collaborators and their genius for communication is apparent from the opening of the book where we are given clear and precise descriptions and illustrations of the roles played by the various parts of the vocal apparatus. Simple practical tasks are suggested to give an awareness of the point being discussed, and these are reinforced by Michiel Haijtink’s amusing cartoon-like drawings. Sections 2 through 5 dealing as they do with the voice users, their personalities, their lifestyles, and their professional activities, provide the reader with a wealth of information and good, down to earth, no nonsense advice on the way our daily activities impact on our voice and how we should conduct ourselves in order to maintain a healthy voice usage. Diet, Exercise, Smoking, Stress, Vocal Activities, Environment, and the Job, are all examined from the perspective (sic.) of vocal well-being. Section 6 – The Physical Program – begins a series of practical steps aimed at achieving better voice usage. There are three stages of reform that are proposed to achieve this goal: Exploring and Discovering the bad existing habits; Re-programming the System with healthier patterns of use; and Habitualizing these new patterns so that they are reflected in all speech and vocalizing activities. Each step of this program contains clearly explained and easy to carry out exercises which, if repeated with the suggested regularity, lead (sic.) the voice user smoothly through the desired re-programming and habitualization process. 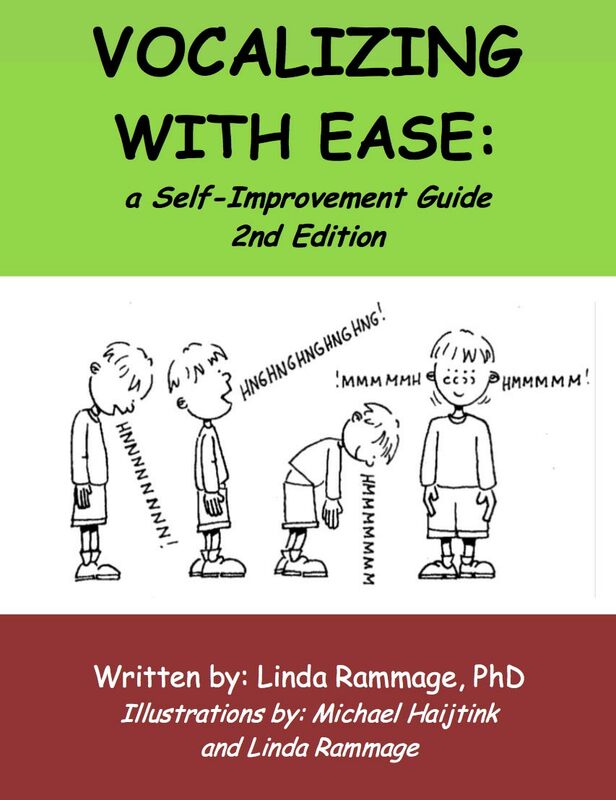 Throughout this section we again benefit from Linda Rammage’s skills as a therapist and communicator – and her sense of humour (which is never far below the surface) is again manifest in the description and the imagery of the proposed exercises. This is a book for all professional voice users. It shows what our voices are, how they should function, and how we can get them to do so in the healthiest way. All this is in a delightful, humorous way that never gets overly technical but at the same time never misses a single important point. Reprinted with permission, from VOICE TALK, Volume 3, Issue 1, Spring, 1997. Canadian Voice Care Foundation, 2828 Toronto Cresc. NW, Calgary, Alberta, T2N 3W2. Phone: 1-888-284-9590 (toll free); Fax: 1-403-289-4988.